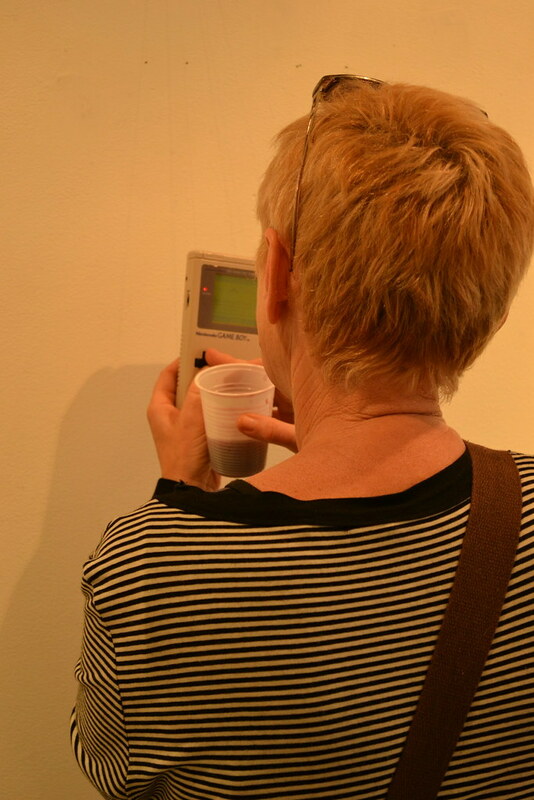 Free Gameboy is a minimalist tool of emancipation assigned to the free diffusion of information. Or, defined differently, how could we take back obsolete interface in favor of critical thinking? 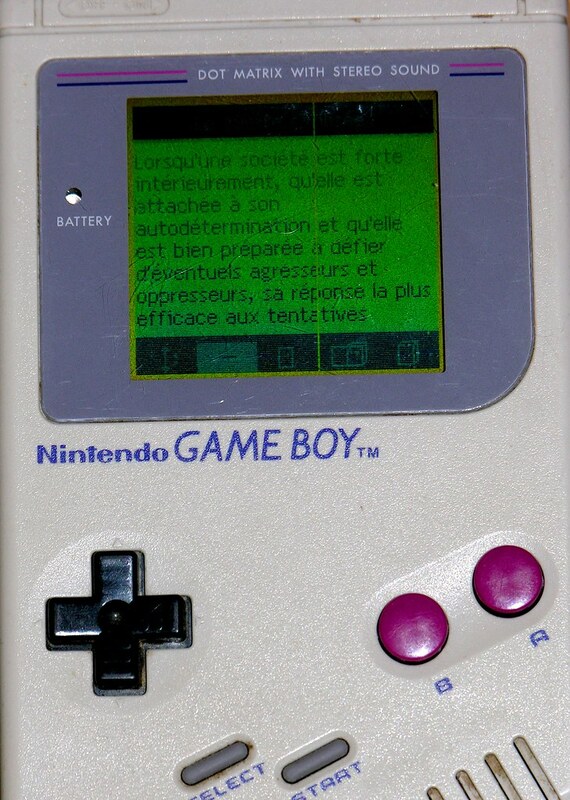 In aiming to develop a deviant and contagious tool for the empowerment of knowledge, Sandra and Gaspard Bebie-Valérian seized an object of mass consumption, a precursor symbol of embedded technology, emblematic of changes during the post-industrial society: the Gameboy. 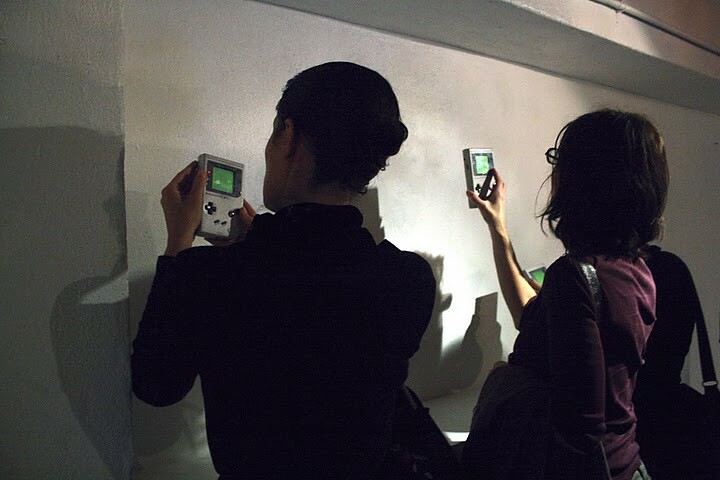 In retrospect, the Gameboy foreshadowed – already twenty years ago – our current technological functions: portability, individuality, connectivity. 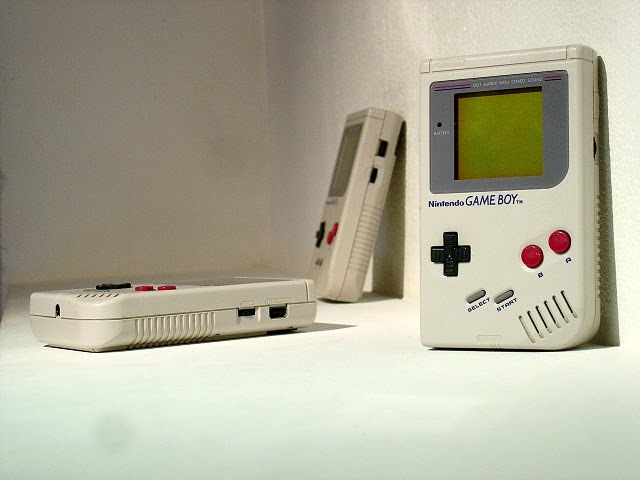 Nowaday, the first generation Game Boy is a mass object obsolete: a dinosaur Ipod which today does not worth much. 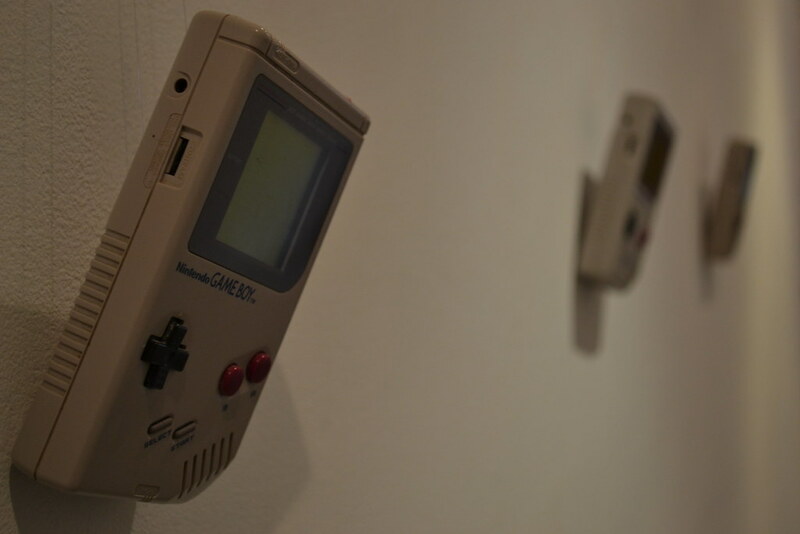 Yet the Gameboy remains a functional object even more fun to divert as its usual value is almost zero. 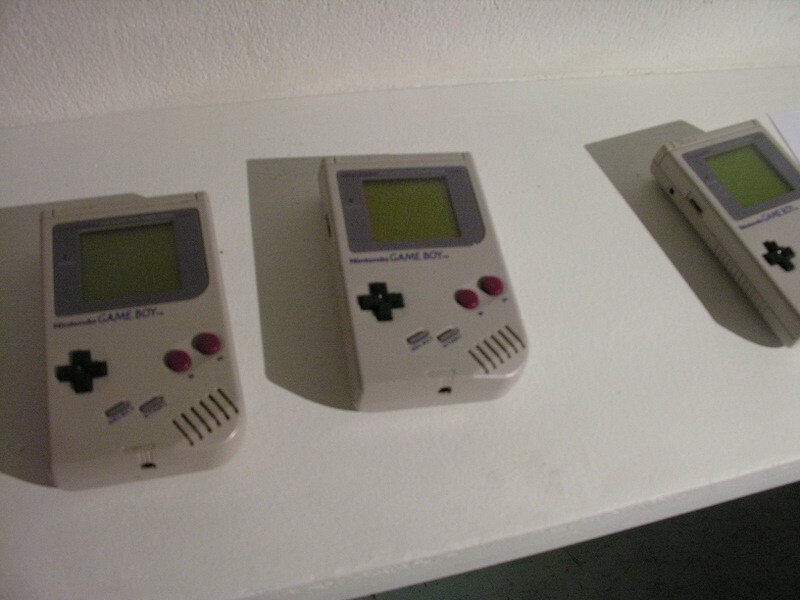 The two artists have therefore developed a hack from the Gameboy, easily exploitable and diffusible as sort to make several unities available and potentially reusable in different contexts (Do It Yourself or domestic engineering). The content broadcast by these modified units is then shared in the form of interchangeable cartridges and thus enrichs the existing means of dissemination and sharing of specialized knowledge related to autonomisation. 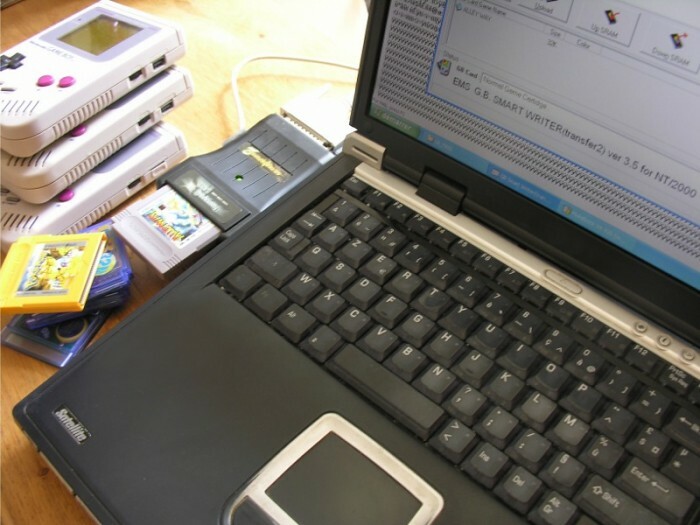 Several resources are identified and integrated into the gameboy, fact sheets, crafts of all kinds, construction techniques, mechanical, health, agriculture, phyto-purification, medicine, education but also any intellectual territory, literary, ecological, sociological, economic policy which gives an awareness of the world in its mechanisms and workings. 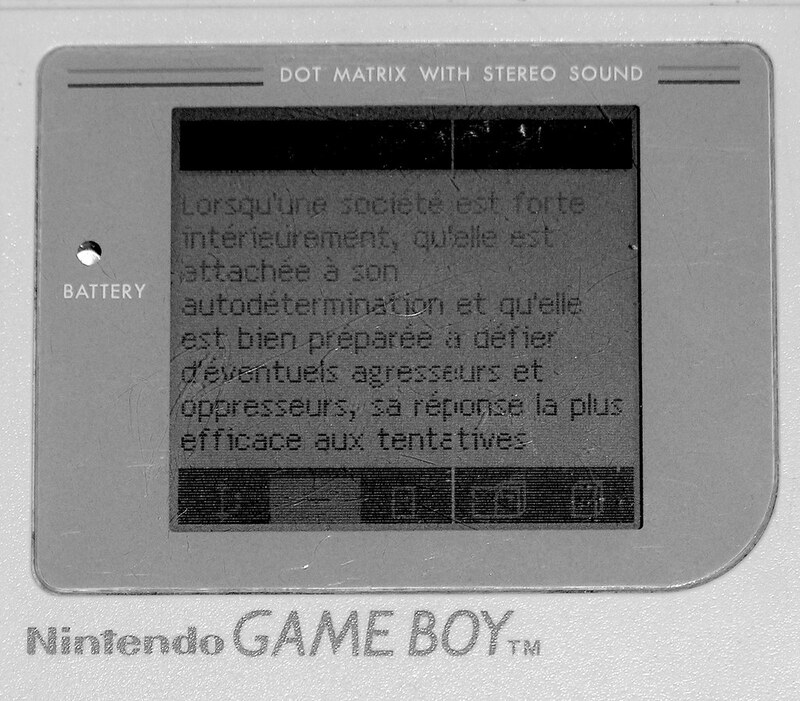 Free Gameboy is a free diffusion of knowledge, free from restrictions of uses, distribution, copyrights and other patents. Convey knowledge can take different methods and purposes. 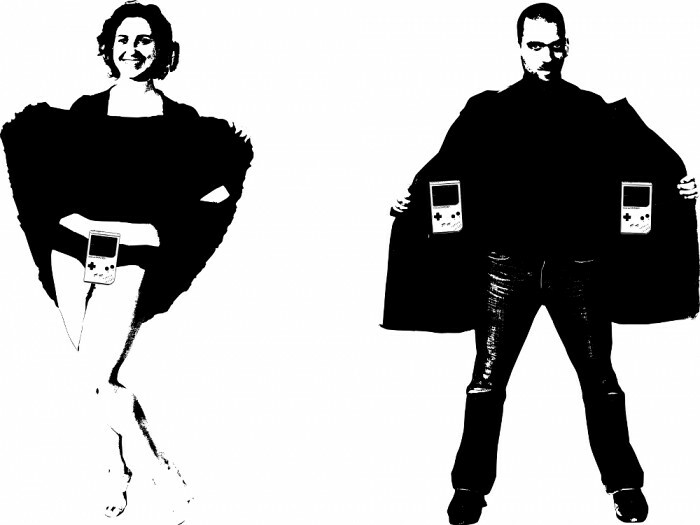 The case of the Free Gameboy reports of some interest because it embodies our current relationship with information, accessibility and assimilation habits, reading that join it. 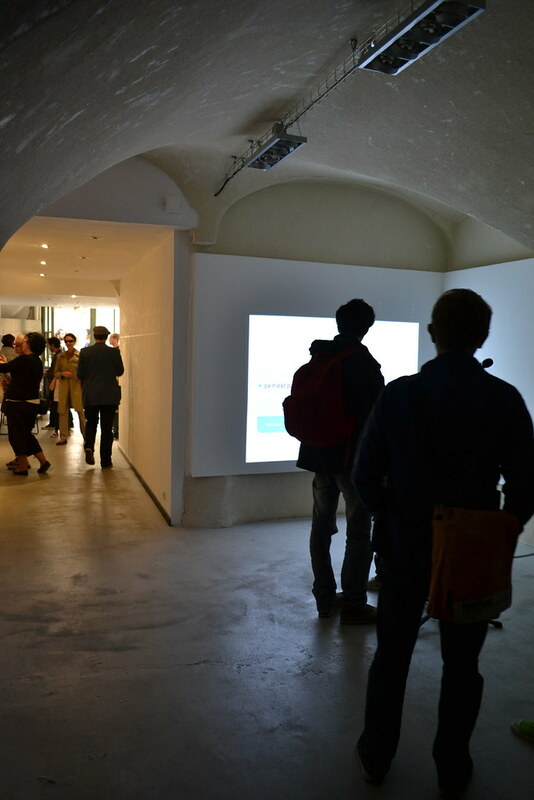 In a sense, this project conducts a retrospective and prospective translation, trying to divert a banal and daily use of current technology – driven by an immediate place, either internet, hypertext and the permanent accessibility from any suitably equipped device over wifi or bluetooth – for a laborious and rare use of outdated technology supported by hardware instead, or the cartridge, the constraint of unique content to each, its materiality and simplicity. By reactivating the waste, Sandra and Gaspard strive to create an economy, itself altered. Moreover, the object appears in a shift. 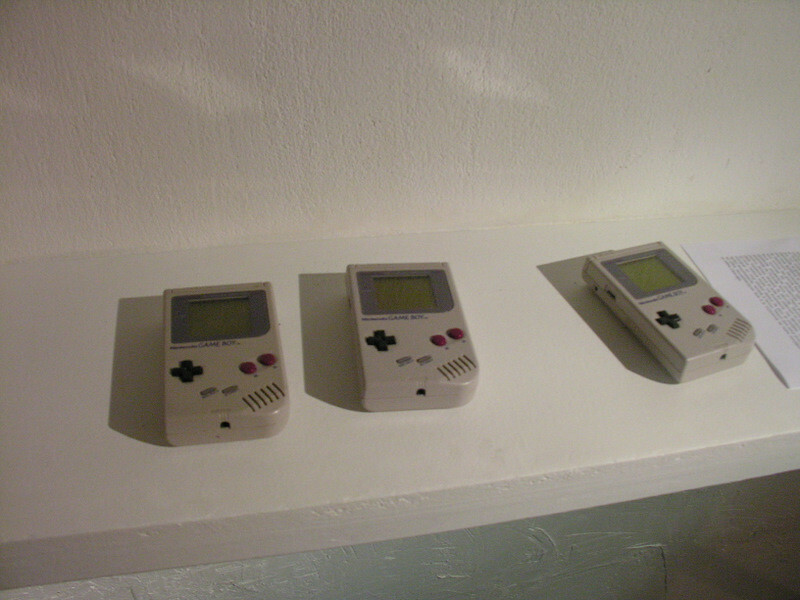 Free Gameboy is a tool, a vehicle, a discreet and insignificant circulation channel. 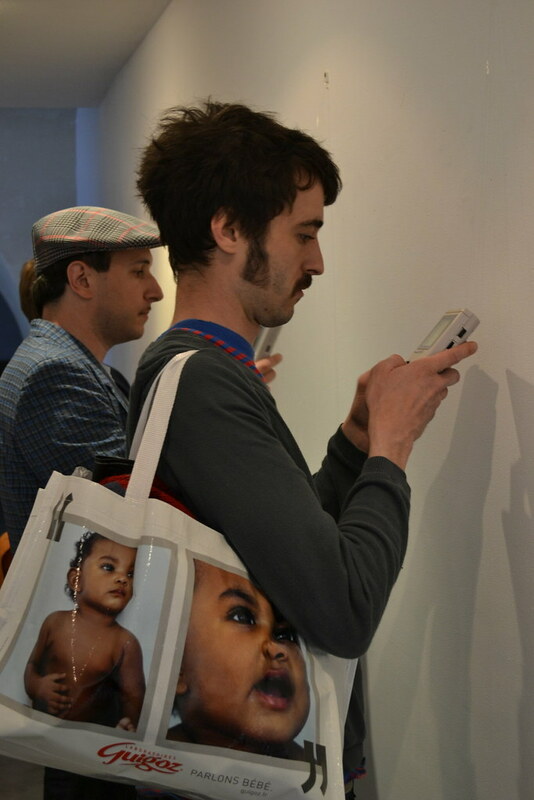 He takes to his advantage the concepts of portability, exchange and circulation. 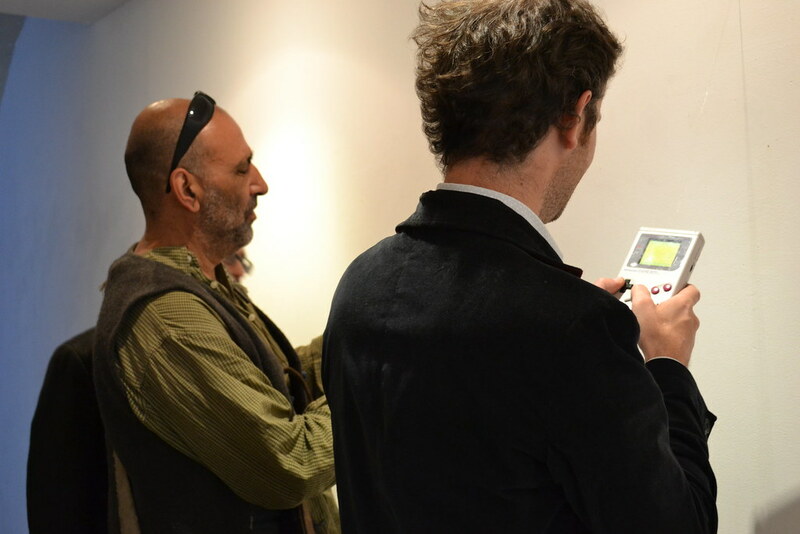 Like the bookcrossing practices, verbal jousting or outdoor sessions of the Free University, Free Gameboy relocates the place of knowledge and accessibility.